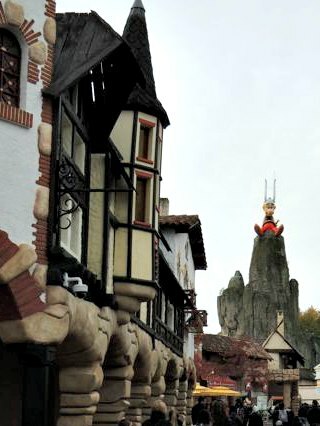 Forget Disneyland, go to Parc Astérix! I am an adventure park addict. I discovered this obsession only a year ago, when I was taken to Disneyland (a dream come true for every Eastern European girl, heh). 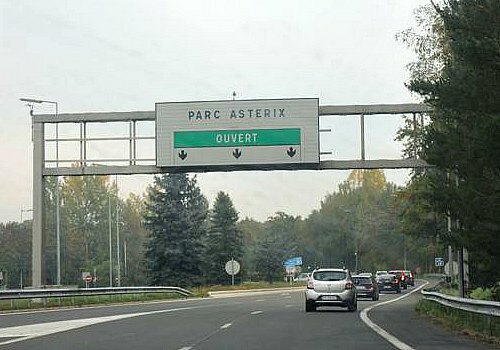 When I was mentioning this day trip to my friends in Paris, they were all saying – you gotta go to Parc Astérix instead. Ten months later, I did and I did not want to leave. When I was little, I had once a panic attack on a chain merry-go-around that was stationed in our mountain city. It was turning, fast, I was alone on the chair, it was revolving faster and faster and it seemed endless, I was crying and sobbing and panicking. I wanted to leave, immediately. Since then, my mummy was always discouraging me from circus like adventure thingies and I guess I needed to get older and crazier and to discover different types of adventures to be able to fully enjoy driving with my head down and listening to my own scream and the others’ too. 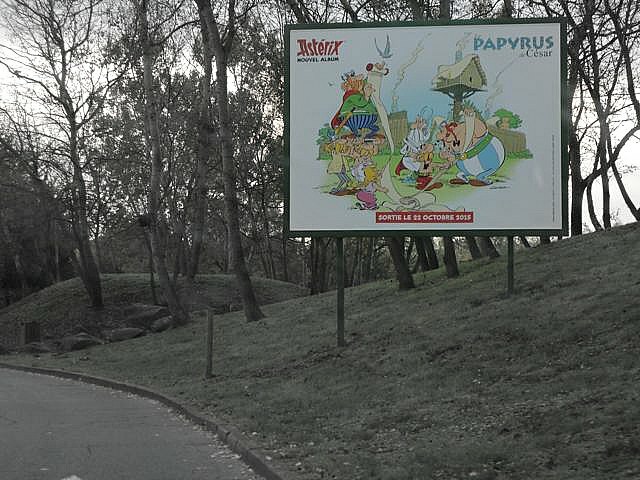 So, when I was returning to France in October, I simply had to pay visit to Parc Asterix. I bought tickets in advance and it cost me 36€, which compared to Disneyland where I paid twice as much last year, seemed like a good deal. The main thing about adventure parks is that you have to arrive early. 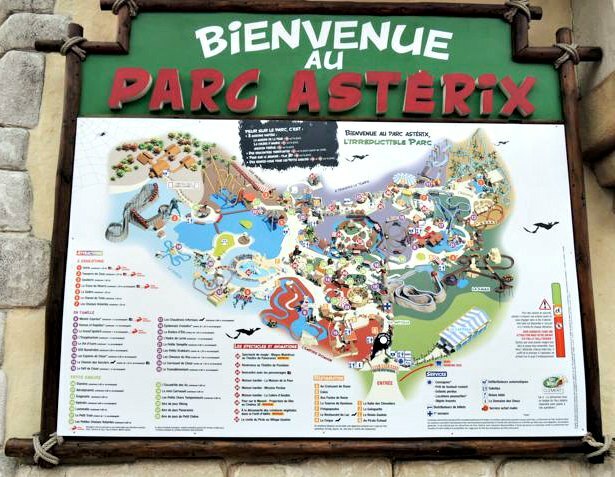 Parc Asterix opens at 10 am, so better be there in time to have enough time to explore everything (and still it would not be enough). A view from the parking lot and a nicely visible indicator showing which way to go. I have never been a big fan of Asterix and Obelix, but I kinda felt sorry for the guy sitting all the way up there as he looks quite sad. A new comic of Asterix and Obelix was getting out soon. Papyrus de Cesar for everybody, whole Paris was full of it on the release day (22nd October 2015). Just reminded me how big the comics culture is in France. Similarly to Disneyland, there is a lot of little houses with merchandise. Good strategy, people buy when they enter and cannot resist when they leave. Compared to Disneyland, it was less overwhelming and a lot less commercial. My advice to whoever goes to an adventure park and always forgets to take a map by the entrance (me) or loses it 10 minutes after entering an adventure park (me, when first does not apply): always make a picture of the map. 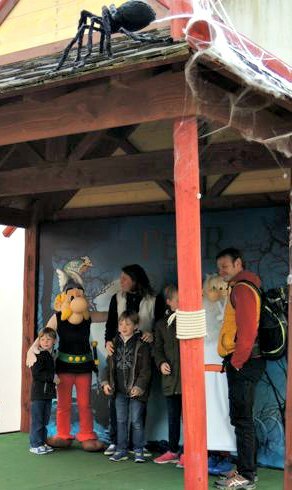 Proof that there is Asterix at Parc Asterix. But you have to wait a long queue for a selfie and you are surrounded by loooot of kids. I gave up. I am not so crazy for him and anyway we came for some adventure and adrenalin. Our first adrenalin ride was the La trace du hourra (trace of the Hurrah). 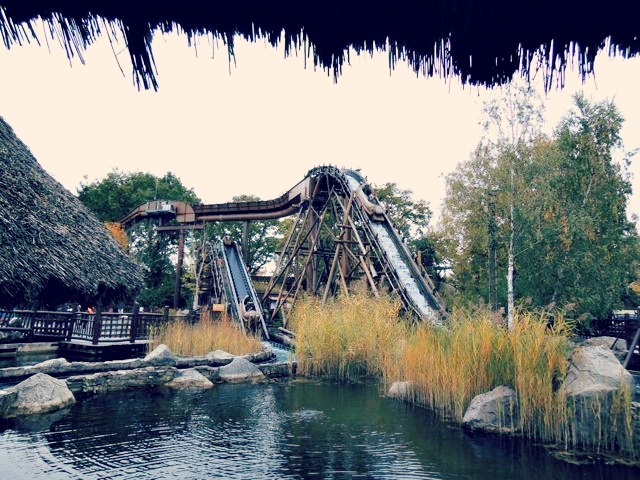 I was quite surprised that it was a sliding roller-coaster and it felt really fast (60 km/h). We had to stand a little queue, but as a starter, not bad! My little roller-coaster test is if after the ride I have some tears in my eyes, it was a good one. Tear factor of La trace du hourra – 2 and a moment when I realized that doing a make up in the morning was a waste of time, priceless. Few things you need to know about Parc Asterix is that there are barely any foreigners and a lot of instructions are given just in French, but to be honest, it always breaks down to the basic ones – do not have any loose items and do not stick out your hands out of the wagon plus always buckle yourself. 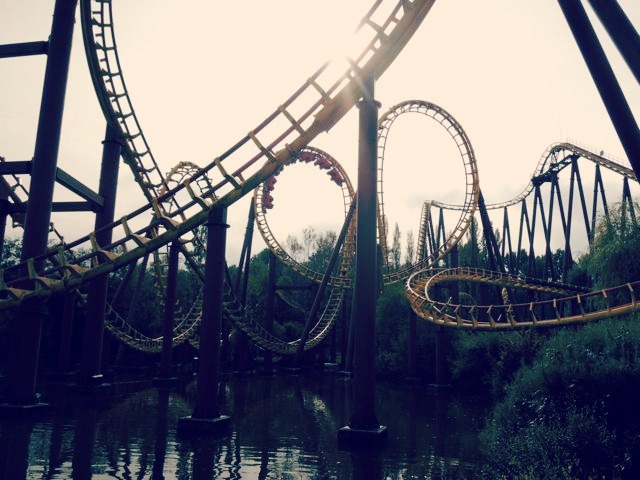 So if your French is not splendid, do not be scared to go to Parc Asterix, it will be JUST FINE. After we decided to have a little coffee, while sipping it next to a cemetery, we got disturbed by a bit disturbed guy with a real chain saw and a lot of screaming people there were trying to escape him. 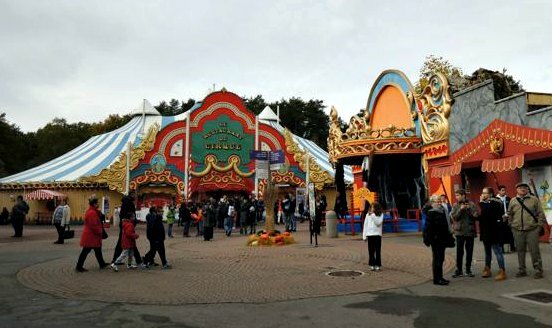 No wonder, because it was just about Halloween and the whole Parc Asterix had a theme of it – Peur sur le parc (Fear over the Parc). I really liked the branding and I think that the staff was enjoying themselves as much as the visitors did. After surviving the chain saw attack (the guy came out 5x before we managed to finish our coffee and cakes), we decided that we have to try the number one – OzIris. 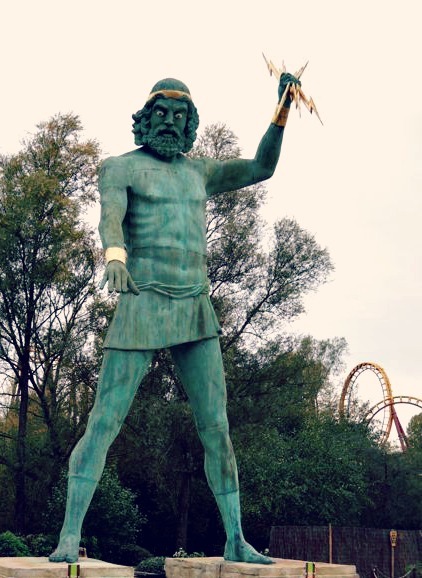 The whole Parc Asterix is divided into 6 different worlds – Welcome to Gaul, The Roman Empire, Egypt, Ancient Greece, The Vikings and Travel through time. I like the idea as it brings on many different styles and decors. I love the traffic sign. I also like that there is a lot of attractions going above your head so you can see how other people enjoy themselves. 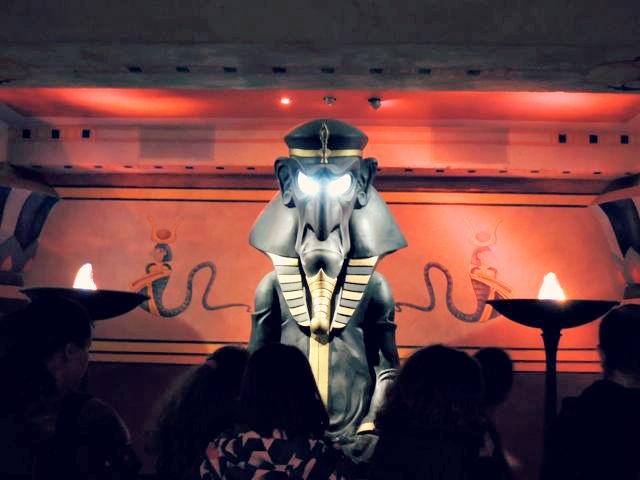 The Illuminates are everywhere – an obelisk in Parc Asterix and the craziest roller coaster I have ever been to behind it – OzIris. 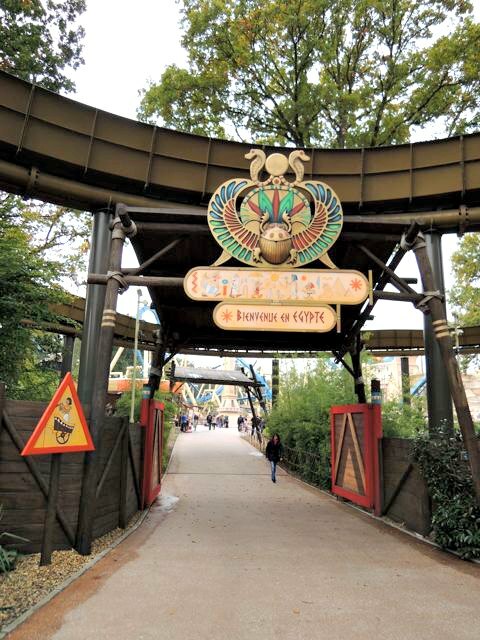 I must say that I was regretting a lot eating all those Bonne Maman Tartelettes together with the coffee when I was entering the Egyptian part of Parc Asterix. Just seeing the crazy construction, people riding it and all the people around it (who did not find the courage or were too short for it), just made crinkles in my toes and I just had to go try it. Yes, their legs are freely hanging out of the seat. Freaky! It never happened to me before that my adrenalin would be so high that I would totally forget to scream. After the ride (90 km/h), my legs were very weak (levitation effect high) and I felt like I really underwent hypnosis. 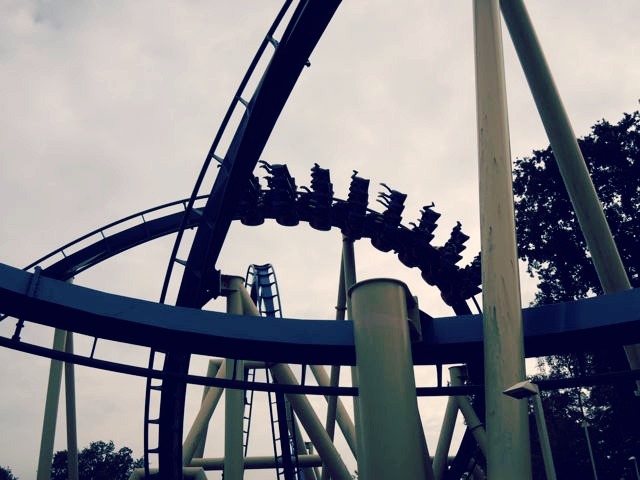 This was so far the strongest experience I ever had on a roller-coaster! Tear Factor – 1*! This got us started and we had to get more. The next step – Goudurix. This thing looks just majestic. After queuing with no kids (the height requirement of 1,4 m was quite restrictive for many little visitors), which I used to post a selfie to Facebook (all site wide free WiFi is always handy, cannot be found in Disneyland), we got in. You ride in a little wagon (at 75 km/h) and one of the instructions is to hold back your head. This attraction has been criticised for being very hard for your neck and some re-tracking adjustments have been made in 2013. To be honest, I did not feel any difficulty or pain in my neck. The ride was just perfect! 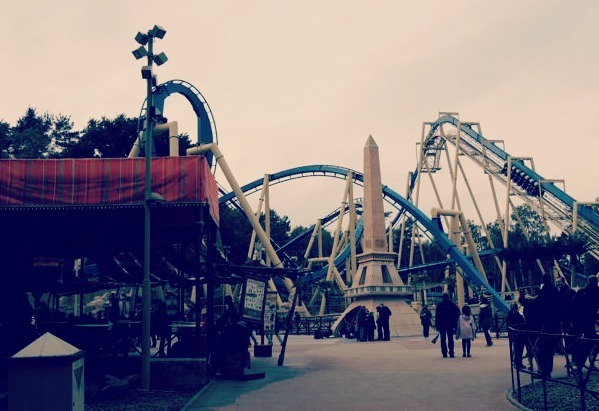 I really enjoyed the moment when I felt that I must totally hit the ground with my head when I was in one of the seven loops. Tear Factor: 3. 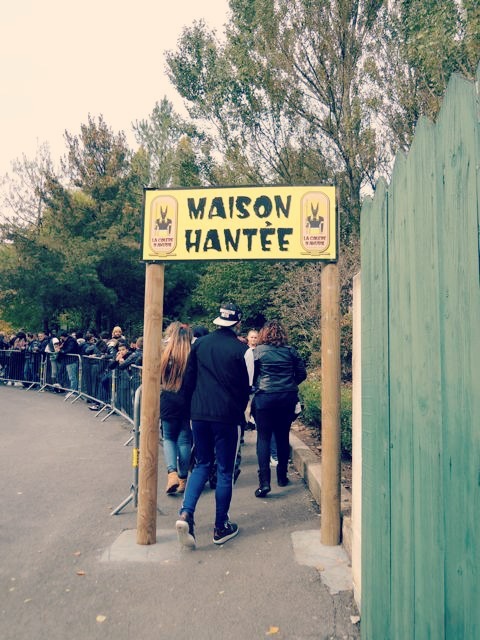 As the Halloween and the fear was definitely on, we decided to visit one of the 4 haunted houses in the Parc. We spent one hour in this queue, which did not seem long, but it was not advancing fast. There were 4 French girls before us, 2 of them gave up when entering the first room. Cowards! It was a change as you were walking through a house, no ride, no safety of a wagon surrounding you and taking you away. If you do not speak French, then maybe avoid this one as the monologues were quite underlying the atmosphere and understanding them is a bit of a must. It was a bit less enjoyable with small kids pushing back when walking through the attraction and teenage girls screaming as if they were getting stabbed right here, right now, but it was a nice change after all the adrenalin rides. Oh, the masks contributed to the authenticity of the place, it was just unreal and unbelievable! 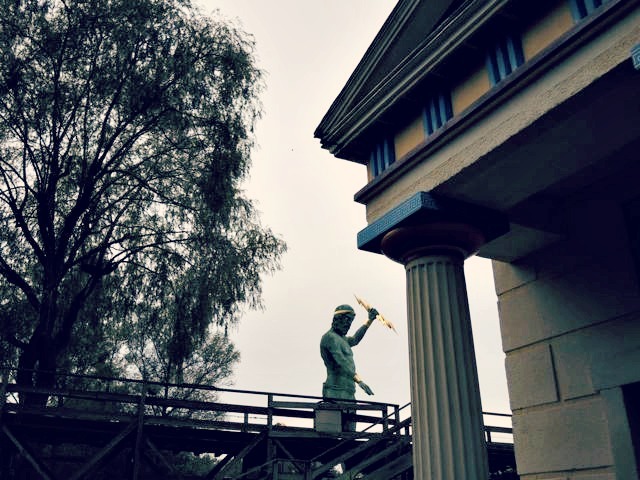 Located in the Ancient Greece part, the ancient buildings are a bit too shiny and colourful, but the majestic statue totally adds up to it – the thunder and his Zeus. 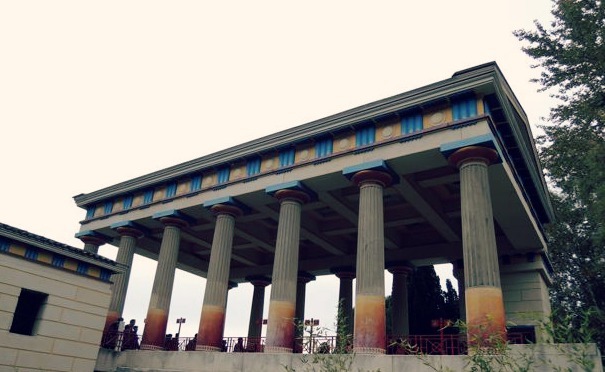 The attraction Tonnere de Zeus has a slope of 50% and the average speed is 73 km/h. Tear factor: 3. The attraction got stopped because one rider lost his scarf. After, there was a test ride with just one member of staff. This must be really a great job. I am still not sure whether I like the sculpture. The look in the eyes is kind of…terrifying. We saw only the end, but if I come next time, I plan to see it from the beginning. 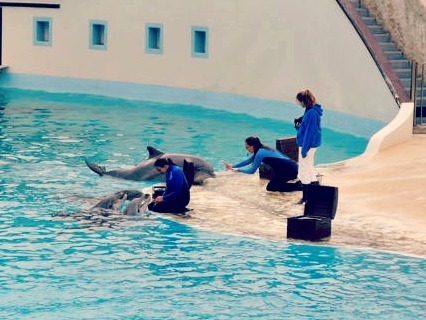 It was probably my second time I saw dolphins in my life (first time was in the UK, where I loved them so much that I even bought a dolphin brooch with my name on it and still have it), because Prague ZOO is not having a dolphinarium. If you speak Czech or want to try to Google translate it, this is the reason why. Then we tried the attraction Le Cheval de Troie, which was surprisingly quite enjoyable. A different form of adrenalin, yet still a gravity play. No tears, though = 5. Although I was begging a lot, there was no time to go for La foret d’Idefix (Idefix forest) adventures for the little ones. After being last year in the “It’s a little world” in Disneyland, I totally have a need to see something insanely cute again. Next time. So as a little memory and a plaster for my sorrow, I bought myself an Idefix T-shirt. When deciding on what to do next in the remaining time until the park closes at 6 pm, we unequivocally decided that we will go again to OzIris, although there were a lot of things we did not do yet. But the magic of hypnosis was attracting us again. So we did. This time with a little queue (still much faster than any top attraction in Disneyland, where the waiting times are often more than 1 hour), so I had time to make some pics in the temple. The walls were covered with a lot of comics-like linguistic jokes, so you were never bored while waiting (if you spoke the language, ah again). The second ride was much better than the first one, because we were sitting in the second row. This was hilarious as you really saw the ground coming and felt the water splashing you much more than at the back where we were sitting during the last ride. True addiction! Le Grand Splatch was closed for technical reasons (another proof that I gotta return again!) 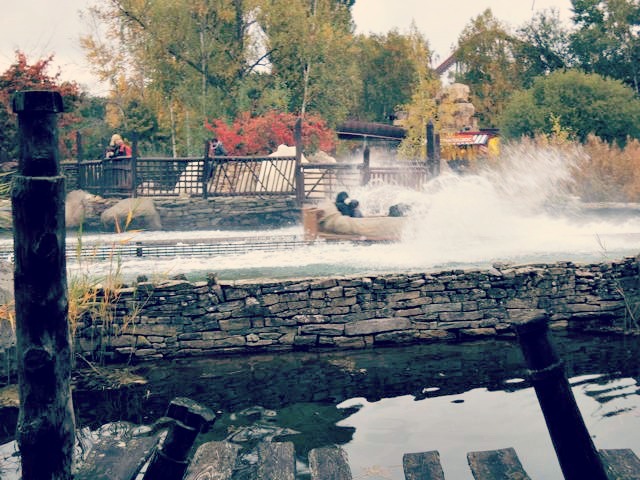 so at the end of our day in Parc Asterix, we decided that we need to get wet on this attraction. … and the final landing at 4:35 is also quite hilarious. This is something that I really enjoyed at Parc Asterix: many attractions have been having quite some twists and surprising moments. This was surely one of them. This post is getting very long (and I promised Matthieu that I will keep them just long enough so he can read them while on metro). Come back soon for a second part with funny interior picture gallery from Parc Asterix, because I have many more funny stories to share. or follow me on Twitter or Facebook. 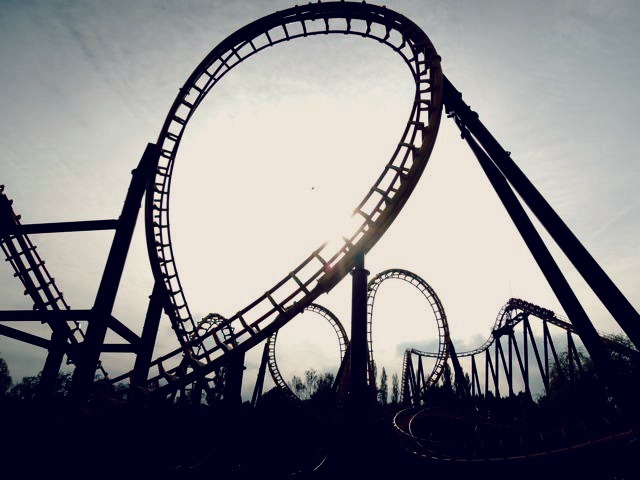 Which is your favourite roller coaster ride? 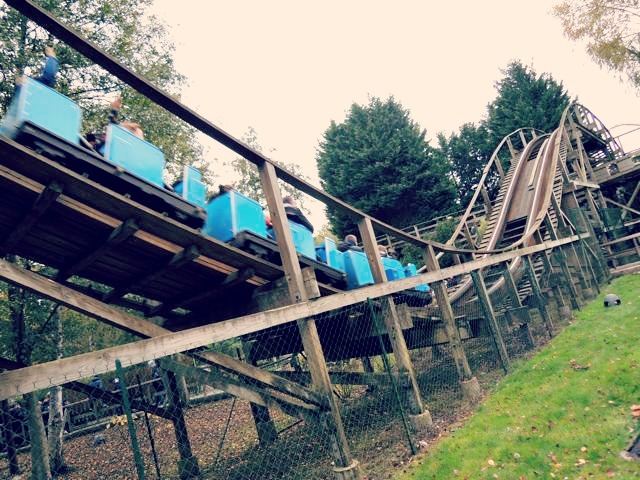 And did you ever experience something extraordinary when in adventure park? Drop me a comment below, I would be thrilled to read your stories. You should! It is not far from you and it is also not that expensive (compared to Parc Mickey as a guy called it when I was buying the Idefix T-shirt). Haha, I was hoping that with this post I could raise some good memories for my readers. Glad that you had a great fun and I think the Goudurix ride is now a bit milder as they were doing some improvements to make it less hard for the neck. It was 🙂 although I am not a big fan of taking animals out of their natural habitat, I must say that for some people this was the first time they could see one. Thank you for sharing your thoughts on the park! As a theme park junkie myself, I’d be a little nervous not knowing french and going somewhere where some safety issues were involved but common sense first! No need to worry, they have actually some descriptions in English and people around do speak English when approached. So it is totally fine and as you say, common sense first! 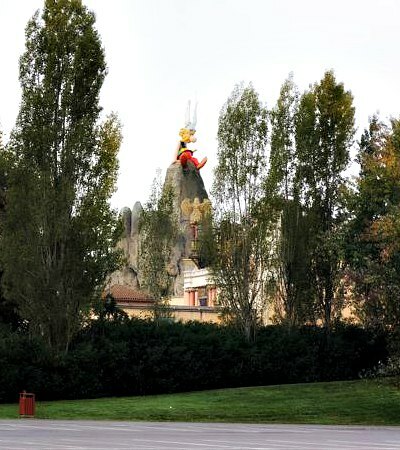 We were just in Disneyland Paris this past May… I had never heard of this park. Totally bummed as I am sure my munchkins would have had a blast there. Thanks for sharing. I will have to remember the next time we are traveling through France. I bet the munchkins would love it, especially since the queues are not so long like in Disneyland! OMG that ride looks crazy! True, I really felt a bit like a kid when I was there. If you happen to be close to Paris one day, try to incorporate it in your plan. Wow those rides look amazing! I love this post, have shared this on twitter. Thank you very much for spreading the word about this post! I like the adrenaline you get after the ride is over. It is truly addictive. 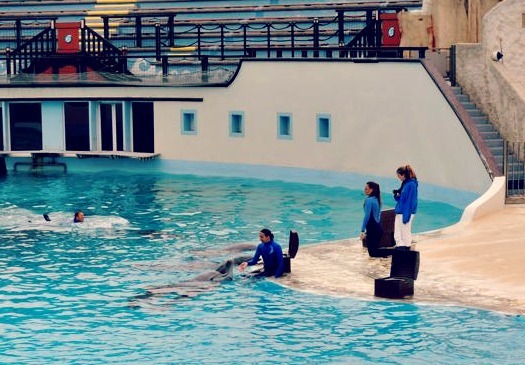 To be honest, I was not so thrilled by the dolphins either and I did not go to see the dolphin show, I just went to check the feeding part and that was already feeling a bit strange. 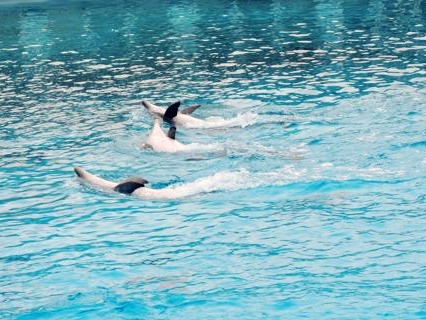 But it is a part of the Parc Asterix and for many people this is the first time they see dolphins. This park looks like a LOT of fun!!! Something else to add to my bucket list! Thanks for linking up to Travel Tales! Julie, thanks for stopping by and leaving a comment. If you ever plan to go to Paris, this is a good choice. Thanks for such a nice and long comment. You will for sure love Disneyland if you take your 5 yo there 🙂 I went there for the first time last year and I really had a great time and I am much older. The nice thing about these parks is that people of any age and any courage can have a lovely time there.